GE Additive (NYSE: GE) is creating the world's largest laser-powder additive manufacturing machine. Tailored for the aerospace industry, the machine will be able to print in a "build envelop" of one meter cubed (1000mm x 1000mm x 1000mm). The development project, announced at The Paris Air Show, will be unveiled in November at the Formnext Show in Frankfurt, Germany. 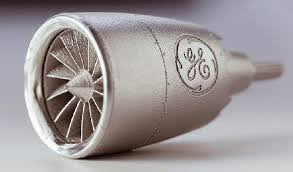 "The machine will 3D print aviation parts that are one meter in diameter, suitable for making jet engine structural components and parts for single-aisle aircraft," said Mohammad Ehteshami Vice President and General Manager of GE Additive. "The machine will also be applicable for manufacturers in the automotive, power, and oil and gas industries." The initial technology demonstrator machine, called "ATLAS", is a laser/powder machine and will be ‘meter-class' (1000mm) in at least two directions. The GE team has been developing the machine over the past two years and several proof-of-concept machines have been built. In the machine's production version (1000mm x 1000mm x 1000mm), the build geometry will be customizable and scalable for an individual customer's project. Its feature resolution and build-rate speeds will equal or better today's additive machines. It is also designed to be used with multiple materials, including non-reactive and reactive materials (such as aluminium and titanium). "We have customers collaborating with us and they will receive beta versions of the machine by year's end," Ehteshami said. "The production version (yet to be named) will be available for purchase next year." GE is targeting first deliveries of the machine in late 2018. The technology demonstrator builds upon GE technology, combined with Concept Laser's expertise in laser additive machines. Concept Laser (a German-based company which GE Additive has controlling ownership) currently has the largest laser-powder bed additive machine on the market with a build envelope of 800mm x 400mm x 500mm. Additive manufacturing (also called 3D printing) involves taking digital designs from computer aided design (CAD) software, and building them on an additive machine, layer by layer from metal powder. Additive components are typically lighter, more durable and more efficient than traditional casting and forged parts because they can be made as one piece, requiring less welds, joints and assembly. Because additive parts are essentially "grown" from the ground up, they generate far less waste material. Freed of traditional manufacturing restrictions, additive manufacturing dramatically expands the design possibilities for engineers.